Ethio-Eritrean border along the town of Zalambessa is closed again, Gulo Meheda district head in Tigray regional state told VOA Amharic service yesterday. The border was opened in September of this year and there has been two ways movement of people to and from both countries since then. Eritrean government did not disclose the reason as to why it decided to close the boarder at the time news was reported by VOA Amharic. 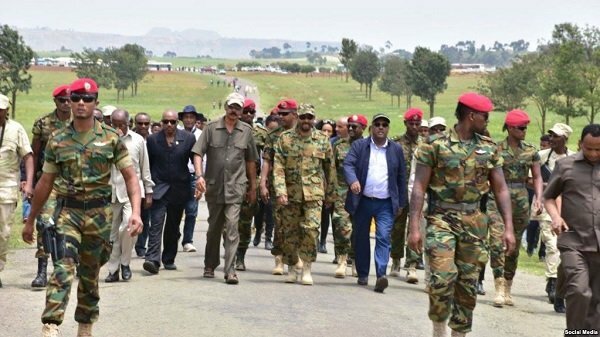 An Eritrean news portal on social media, Eritrean Press, reported yesterday that there are speculations that the border closure is linked to assassination attempt of Eritrea’s former minister of defense, Sebhat Ephrem, who is said to be in a stable condition. Although Tigray regional authorities claimed that they have reported closure of the border to the Federal government, Ministry of Foreign Affairs spokesperson, Meles Alem, who is now appointed as Ethiopia’s ambassador to Kenya, reportedly told journalists that government is not aware of the border closure. DW Amharic service reported yesterday, citing residents in the region, that Eritrean border guards demanded laissez-passer and denied entry to Eritrea for those travelers without it.